At the end of April 2012 I went on the Royal Caribbean Freedom of the Seas to the Eastern Caribbeans. Our itinerary was supposed to stop at Cococay, St. Thomas and St. Martin. Unfortunately the seas were too rocky for us to tender to Cococay so the cruise ended up with two ports only. Nonetheless it was a beautiful cruise ship, the weather was great and the islands were absolutely beautiful. 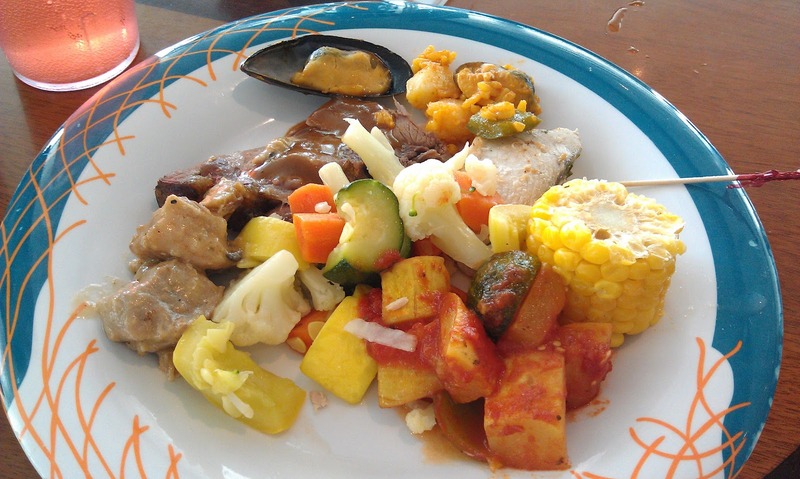 One of the highlights of cruising is of course the food! I took MANY pictures of the food on the cruise so I will be splitting them into separate blog posts. On the first day of the cruise we bought the beverage package deal. Adult pricing is US $45 each with additional 15% gratuity, there is no tax. It came with a Coca Cola souvenir mug and a sticker to put on your Sea Pass (room card, payment method, etc. 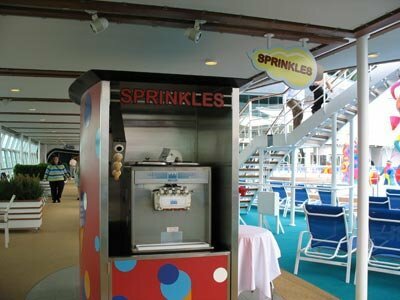 used on the cruise) which allows for unlimited fountain soda at all ship locations and throughout the entire duration of the cruise. Honestly the mug was pretty bad quality, it looked nice on the outside but the cover part for the drinking area was loose and a slight tip of the mug will cause your beverage to spill everywhere. I don't believe I drank the value of the $52 I paid for the soda but I'm not really a soda person anyways. 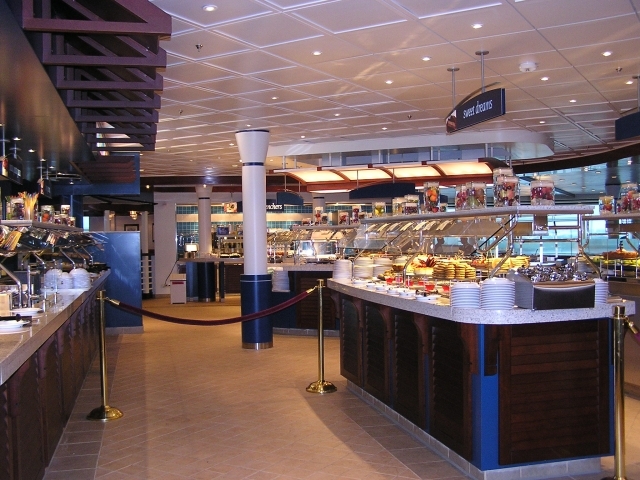 The Freedom of the Seas has a Royal Promenade on Deck 5 which is where all the shops, cafes, and other miscellaneous snack and bar restaurants are. Royal Promenade is a good chill spot during the day because almost everyone is on the decks sun tanning. Cafe Promenade sold Starbucks coffee (additional charge) and had a good assortment of cookies, muffins, and sandwiches. The croissant sandwiches always smell buttery and delicious in the morning when the croissants are freshly baked. Definitely recommend spending some down time here away from the sun. Ben and Jerry's Ice Cream (additional charge) had about 16 flavours of ice cream but during the duration of my cruise it was never busy. I don't remember seeing very many customers here probably because there is complimentary ice cream by Sprinkles offered on the sun decks. Sprinkles has soft serve ice cream and only vanilla, chocolate, or swirl of both flavours. Cupcake Cupboard (additional charge) was also not very busy. It held cupcake decorating classes for a cost. I didn't try their cupcakes but the presentation does look very good. Sorrento's is located at the end of Royal Promenade and is a pizza joint. There is no additional charge. Pizza, paninis, anti pasti, assorted bread, and desserts are served here for the majority of the day. Come here for a late night snack when other places are closed! The pizza is just regular fast food style, not that special and the paninis were actually kind of disappointing because it wasn't even toasted properly and slightly soggy. The anti pasti was good and had quite a variety. The desserts consisted of mousse or tiramisu in a cup and cookies. The tiramisu was poorly made, it just tasted like very sweet cream and soggy cake. The cookies were good though and are the same cookies served at Cafe Promenade. Windjammer is the buffet dining area of the ship, it serves food from about 5am in the morning to later in the evening. The Jade Cafe is actually not a separate restaurant but just a part of Windjammer. Most mornings I came here for breakfast and especially to have the made-to-order omelettes that are made on the spot. I always had an egg white with mushroom, onion, and herbs omelette. Yum! Breakfast always had hash browns, omelettes, fresh fruit (melons, watermelon, banana, kiwi, apple, orange), bacon strips, sausages, porridge, cereal. Lunch always had fries, burgers, pizza, fresh fruit. There's always dessert served at Windjammer but mostly sponge-like type or mousse cake. I personally really enjoy cheesecake and there was only one or two occasions when they had cheesecake but it wasn't even good. It tasted more like sponge cake with cream cheese in it than actual rich, creamy cheesecake. If you enjoy American style food (that is with lots of bacon, cheese, burgers, fries, pizza) then you will like the food served at Windjammer. I really feel like it is catered toward American taste buds compared to the Princess Diamond cruise I've been on before. The Jade was the cruise's attempt to diversify it's buffet but the selection was very small. Typically the Jade would serve chow mien or some type of stir fry. I tried their sushi once and it was poorer in quality than food court sushi. The rice was hard and the ingredients were vegetables because they couldn't have raw fish as part of their health-food-safety contamination regulation. Don't mistaken that all the food served at Windjammer is fast food style because they do have roast beef, meats, fish, vegetables, etc. but I just meant the key items that are always on the menu are typical American food. 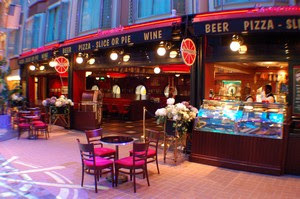 Overall, there are many places to grab a bite on the ship! Some good, some not so good but you will definitely not be hungry or out of options. More on the food in the dining rooms in my next post!